Chapter the Fifth. Matlock Bank and Darley Dale. 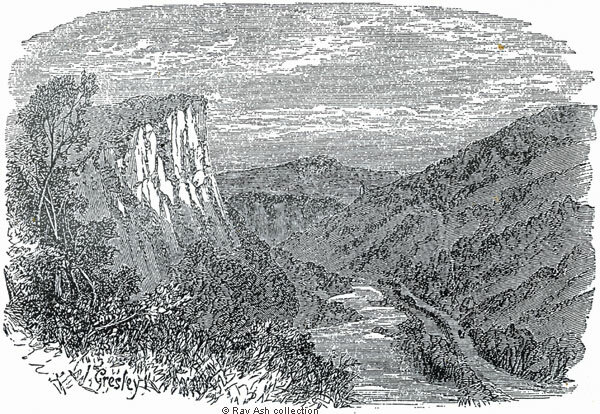 VISITOR at Matlock Bath, having climbed the Heights of Abraham, passed along Masson-side to Upper Wood, descended thence to the Ferry, and rambled about the Lovers' Walks, will, if he has given time for the scenery to make due impression upon him, be more ready for quiet repose than for much further exertion that day. Let us imagine ourselves, then, to have rested for the night, and to be ready for another excursion in the morning. Starting from one of the Hotels, or from the Museum Parade, we soon pass the Railway Station, and mark the train just threading the High Tor with its long trail of white vapour ; and we linger awhile (for who could help it ?) in "the shadow of the mighty rock." Then passing on we find that though the interest of the Dale may be said to culminate at the Tor, it by no means ends there. Many a time we loiter and look back - a wise thing to do occasionally, whichever way we may happen to be wending, the converse view of any scene being often as fresh and pleasing to the eye as one altogether new. Or, better yet, we can cross over from the "the Boat House," and going up by this old foot-path, obtain that view, almost southern, of the Tor the Heights of Abraham, the river and the road between, and the line of rocks and hills in the distance, of which the woodcut below may give some faint idea, though neither pencil nor pen, nor both together, can do adequate justice to such a prospect. It would be possible to go hence over green and sunny pastures to Matlock Town or Starkholmes, or up to Riber's top. But let us rather return and walk along the turnpike to Matlock Bridge, because of the view we shall thereby obtain of the meadow and winding water from which the place takes its name, and of those most curiously waved and striated rock above which stands the venerable old parish church; while Matlock Bank, with its great and little Hydropathic Establishments, its tasteful villas, its scattered cottages, and aspect altogether sunny, airy and inviting, rises far up before us with a cheerful smile. If we turn a little aside into the old village - or town, as it is generally called - we shall find it in great contrast to "the Bath," from which we have just come. Down near the river are certainly some signs of modern change - villas, boarding houses, shops, and the Matlock-bridge Railway-station. But, the village itself, with its ancient church, almost equally ancient houses, and aboriginal race of inhabitants, is a place altogether so different, that one might fancy it twenty miles away from the New Bath Hotel. Yet one loves to linger in such places and among such people, awhile. Manners may be homely, but genuine; life may be slow, but earnest; the affections may have but little fire, yet are they stedfast and enduring, in such places; and in a village like old Matlock, with its wakes, its fairs, its simple customs, its ancient traditions "of moving accidents by flood and field," in mine or in cave, on cliff and in quarry, the wanderer, with a mind for it may fill memory's wallet with a pretty good store of information during a few hours' stay, and feel none the worse for his little load when departing. And we now follow, one of the several ways from the village to "the Bank." Any of them will do, so far as the pleasant views they afford are concerned. Twelve or fourteen years ago, when I sometimes wandered here, Matlock Bank was a place scarcely noted at on, but now it is acquiring - has already acquired, a history I thought then what a healthy resort it would be for invalids, and had a notion of making it one. My attention during one visit was directed to a little un-occupied villa. It had a capital position, a good supply of water, and a most lovely prospect, but was too small for my purpose, and for several years afterwards I was far away from it in very different scenes. In the meantime a gentleman whose name has become a household word, Mr. John Smedley, was raised up to do great works in Derbyshire. Extensively known and respected as a successful manufacturer - as was his father before him - he had nothing of this world's luxuries to covet, except good health, which had been for so long a time withheld, as to leave him at length in all but utter despair. In a state of mind corresponding pretty much with his state of body, he resorted, as a final experiment, to the Hydropathic Establishment of Ben Rhydding, and was restored. This gave him an entirely new set of ideas an impulses; and with Mrs. Smedley, who seems to have been perfectly united with him in all his plans, he resolved thenceforth to devote a large portion of his time, his mind, and his wealth, to the promotion of Hydropathy, and to the stirring up of religious feeling throughout the district. It is not my duty here to enquire into the orthodoxy or heterodoxy of Mr. Smedley's views, either as a therapeutist or a theologian. It is simply the recording of a matter of fact, if when I say that the whole neighbourhood was startled, as from a long lethargy, when it saw places of worship rising in every direction at his will and cost; when a hospital for the poor was attached to his factory at Lea Bridge, whilst he went from place to place preaching to crowded audiences under a large portable tent; and when, last of all, he took the little villa at Matlock Bank to which I had given the go-by but a few years before, and added to it gradually - until now, as you there see it, it is a bulk of buildings large enough for a castle, with abundance of comforts inside if not much grace without, and fitted up for the accommodation of a great number of invalids seeking recovery by hydropathic means. Nor is the hydropathic mode of treatment confined to Mr. Smedley's establishment. Scattered all over the Bank are other places. Down at the very bottom, near the Bridge, is that of Mr. Cash, a respectable surgeon. Up at the top is that of Mr. Frost, an experienced and kind-hearted person, who was formerly for a considerable time with Mr. Smedley. The Messrs. Davies, homely but earnest and long-experienced men, have others dotting the scene here and there; nor is it improbable that, ere this chapter is before the public, I may, myself, have added another to the number, to be conducted with mild and genial aids, on a plan of my own. Thus the whole region has, in a few short years, grown into a sort of hydropathic colony. Nor need this be wondered at, considering what a beautiful region it is. To walk or sit under cover and watch all changes of weather in so wide and picturesque a landscape, over which every passing gleam or cloud throws a totally different character - to contrast the peaks and knolls of the hills with the pastoral slopes and winding vales - to mark church and village grey - scattered villas smiling cheerily from among their trees, or clustering hamlet or lonely farm remote - the varying phenomena of the seasons and the arrival of fresh company every day - must be, themselves, in a great degree restorative to many a poor world-worn invalid, even should there be no specific curative treatment at all. But with all the advantages of that in addition, what wonder, if those who come and derive benefit, send others to swell the number from year to year ? But it is not every invalid who needs to be confined to his bed or chair. For the patient whose newly-braced body and limbs enable him to make a brisk excursion, what a treat to ascend to the very top of Riber and gaze far, far abroad, and down upon the magnificent panorama of hills, and dales, and plains ;- to visit Riber Hall and hamlet, and stroll away in that direction to Lumsdale, or to Dethick and Lea; to go some day over Tansley Moor, as far as Ashover, or to the top of Spitewinter, and gain a view of all the vast outstretch of Scarsdale, with Bolsover, Hardwick, and Alfreton Hall on its distant rim ;- or to run down by Starkholmes as far as Cromford Bridge, and back by Matlock Bath; or, as good if not better than all the rest, to wander away for a mile or two along the upland side, and look down on bonny Darley Dale! Hall, Spencer Timothy (1863) "Days in Derbyshire ..." With sixty illustrations by J. Gresley (artist), Dalziel Brothers (illustrators). Simpkin, Marshall and Co, Stationers' Hall Court, London, and printed by Richard Keene, All Saints, Derby. With my grateful thanks to Ray Ash who provided photocopies for me to OCR. Image scans Copyright to Ray Ash and intended for personal use only.